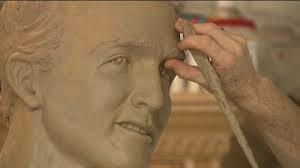 Sculptor Tim King has been painstakingly working on a sculpture of football great Peyton Manning for the past 18 months. When it is completed, it will be made out of chocolate for a local festival. With all this detail hopefully a few bronzes will be cast as well.